Top bars mean top beers and beer lovers are sure to appreciate the choice on offer at Toronado (547 Haight Street). This saloon has plenty on tap and relishes its reputation as one of the oldest bars in San Francisco to serve craft and artisan larger. Their no nonsense approach to a good, cool beverage is renowned. If mixed drinks are more your thing, Rye (688 Geary Street) has this down to a fine art. There's none of the usual surliness with Rye's mixologists; they are known to be some of the most hospitable in the city. But be warned, it is a busy bar and visitors are advised to arrive early at the weekends. For a warm welcome to San Francisco, you can't go far wrong by visiting Blackbird (2124 Market Street). This friendly establishment does what it says on the tin: it serves cool refreshing beers, bespoke cocktails and local wines, all within a buzzing atmosphere. The down to earth attitude of Blackbird's staff make it a mecca for locals and visitors alike. Epitomising San Franciscan style is Zeitgeist (199 Valencia Street). With countless beers on offer, some of the best Bloody Marys in town and delicious flame grilled hamburgers and sausages, this bar has it all. Set out with jam packed picnic tables, it is a social experience like no other. For a taste of authentic city life, Tunnel Top (601 Bush Street) offers the visitor a glimpse of how real locals hang out. Precariously balanced on top of Stockton Street tunnel, this bar is renowned for its eclectic music and cocktails, such as the gimlet, which is served out of a watermelon. Smuggler's Cove (650 Gough Street) is famous all over the world for its rum based cocktails and Caribbean themes. Havana's drinks from the prohibition-era are served up to thankful, thirsty customers who have come to marvel at the vintage ddcor and enjoy rum, rum and more rum. Beat Generation enthusiasts will need to ensure Vesuvio (255 Colombus Avenue) is high up on their itinery list. Famous regulars included Allen Ginsberg and Jack Kerouac who came to celebrate life, talk poetry, art, history and culture. The bar's funky ddcor is tribute to its historical origins and artistic background. Speakeasys grew out of the 1920s prohibition era, when bootlegging and consumption of alcohol had to go underground. Bourbon and Branch (501 Jones Street) claims to be one of the first modern speakeasies, with entry passwords and a few house rules, such as no use of mobile phones. This all makes for a comradely atmosphere and much fine drinking. Kozy Kar (1548 Polk Street) is a 70s tribute bar. It has vans with waterbeds available, 70s music and movies, together with some rather dubious pictures on the walls! 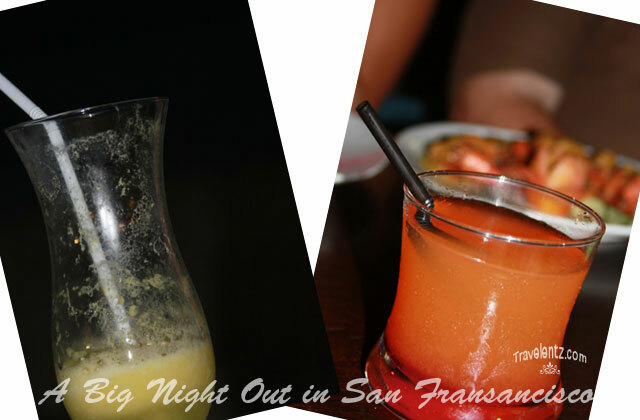 It is the kind of bar that you would only find in San Francisco, standing out against all the others in this part of the city that boasts wall-to-wall bars. I miss SF, though I don't go to bars since somehow by the night, I am so tired from the day's wandering, haha. Miss you Mhie, glad you are back here now in the blogosphere. Hope you enjoyed your cruise. Can't wait to hear of your experiences. I've never been in SF but my friend has been living there since they migrate, and i've seen her with her random post in nice bars in the place.. I go to the bar occasionally, that is if our friend, who works in a bar invites us to go a night out. It is just not my cup-of-tea. Probably if we`ll go together to San Francisco, then we`ll visit that place for sure. A couple friends of ours have just visited Dan Francisco last month. It was a business trip but they were still able to find a way to have fun. And yes, bar hopping was one of their highlights of the trip. Sounds so fun indeed! Not my place to spend time with friends, nevertheless, San Francisco definitely has other great places to visit. I don't go to bars. But, this saloon surely have great stuffs to offer. How I wish I can set my feet in SF someday.